As far as we know, we are the only source of soy-free (certified organic) eggs in the lower mainland of BC. Virtually all egg-producers feed their layer chickens soy-based feed. This applies to both organic and conventional producers. The reason they feed soy is because it's cheap, highly bio-available, and causes the chicken to produce more eggs. But is a chicken designed to eat soy? We believe not. And, up until a hundred years ago, farmers didn't feed soy to their livestock. Somehow they got along without soy. But now, soy is fed liberally to pigs, layers, and broiler chickens, resulting in soy-based meat and eggs. In fact, a large portion of the food you find at the grocery store has been produced using some form of soy. We disagree with this trend. Why? Two reasons: human health, and animal health. First, human health: some scientists claim soy is harmful, citing it as an estrogen-mimicker and a carcinogen. Other scientists claim soy is healthy. Who's right? We don't know, and so rather than take a position on the subject, we just chose to eliminate soy altogether. The other thing is soy-allergies. Many people are sensitive to soy. We know that when chickens are fed soy, it ends up in the yolk, which is a problem for people who need to go soy-free. Second, animal health: we believe soy-protein causes chronic stress in chickens, resulting in a "live fast, die young" flock. Soy-protein "amps" up their egg production, but at what cost? Laying an egg causes inflammation, and therefore the chicken needs time between eggs to recover. Since most commercial chickens lay 5-6 eggs per week, they are in a constant state of inflammation, resulting in high stress levels and early death. That's why conventional layer chickens are typically disposed of before they are 18 months old --- they are already burnt-out. All this for cheap eggs. We believe the modern layer chicken has been pushed too far. 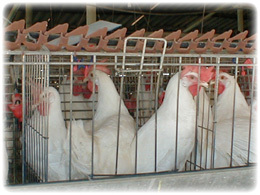 The layer chicken is seen as a disposable unit of production, and no regard is given to the bird's life except as it impacts the economics of the farm. We see this as short-sighted and improvident. It is our opinion that if we are willing to "throttle-back" a little on the egg production, we will have better eggs, happier chickens, and healthier people. And so we've gone soy-free. Yes, egg production has dropped. 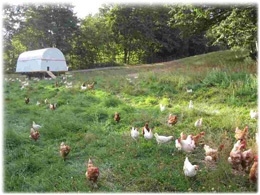 Yes, feed costs have increased (even pastured chickens still need supplemental feed). And yes, the eggs therefore are more expensive. But to us, it's worth it. And, we believe, the chickens think so too.